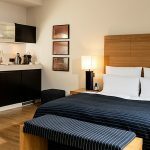 During your trip to Hamburg, our Comfort Apartment extends an invitation to you to relax in a combined living and sleeping area. At 35 to 50 sqm, our quiet Comfort Apartments are our smallest apartment category. In the combined living and sleeping area, you have every convenience at your fingertips – perfect for a short business trip to Hamburg. 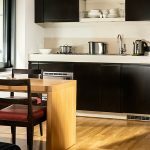 The kitchenettes are fully equipped with a Nespresso machine, including starter set, tea-making-facilities, cooktops, microwave, toaster and fridge. Some of our Comfort Apartments offer a dining table for two. 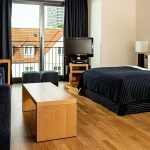 All serviced apartments of Clipper Elb-Lodge are furnished with a hair dryer, make-up mirror, safe, flat screen TV and free Wi-Fi as well as the Sky “Sports” and “Movie” channels. 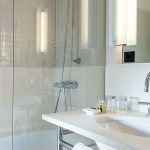 If you prefer a separate bedroom, we recommend our Business Apartment.